This film, written by Arthur C. Clark, and directed by Stanley Kubrick, is tied for "best movie of all time" with The Matrix in my opinion. When Arthur C. Clark wrote this epic novel, space travel was a new thing, there was no shuttle, no moon shot, no hubbel space teliscope. Interplanetary travel was just a far-off fanciful dream, but Clark made it a near-reality for all those who read his book, or saw this movie. One of my favorite parts about this film is that anyone who sees it, but has not read the book will be a) bored and b) confused. The film will make no sense whatsoever. If you read the book beforehand, watching the film is like getting one step closer to living the adventure, very fulfilling. Ok, since I have read the book several times, I will step through the story. Warning, I will spoil the ending for you. A long time ago, some alien species developed the ability to master space and time. They built special 'probes', that could use this knowledge to travel and manipulate objects. 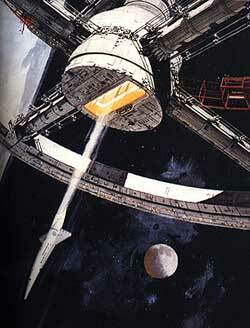 These probes are called 'monoliths' in the film. It turns out these monoliths have been monitoring and assisting in human evolution for millions of years. In the year 2001, the United States builds a great space ship called 'Discovery' to travel to Jupiter, under the pretense of scientific exploration. In actuality the ship was sent to investigate a monolith suspected of being on Europa, one of Jupiter's moons. En Route, Discovery's onboard computer, HAL get's confused keeping his stories straight about the real mission and freaks out. HAL kills all but one of Discovery's crew, and is then Disconnected by the remaining crew member, Dave Bowman. When Discovery finally reaches Jupiter, Dave discovers the waiting monolith. When he gets into his space pod and goes out to explore the monolith, it 'opens', and pulls him inside. What really happens is that the aliens have dicided to get to know Dave, and to do so, probe his mind, and his memories. The fact that they are above time, means that durring this experience, Dave thinks he encounters himself at various stages of his life, old, and young. The aliens actually dispose of Dave's body, but dicide to turn him into something like themselves: a being of energy, above space and time, a 'Star Child'.